Let me tell you a little story. For some of you it may be very familiar. Thank you so much to the clients willing to share their pictures! Gorgeous women, all. A woman who has a lighter hazel or darker blue-green eye color. She may have fairly light hair, often of the sort that sits right on the line between blonde and brown, but may tip in favor of the former. Sometimes, she might have red hair instead. It might be cooler looking (in which case she has typically considered it mousey), or a warmer looking, golden color. Her skin might range from very fair indeed to a light tan. The skin might have some apparent heat to it, but it might not. A woman who looks decently convincing in black, but not totally. A woman who obviously seems to need some darkness. Light, chalky pastels are possibly the worst thing she could do. A woman who can be upstaged by some very intense colors. Put her in BW's most vibrant, cherry reds for example, and definitely if that red happens to be a lipstick, and there's something obviously not right there. Someone might come along and insist it's too cool as well. It certainly might feel that way. Because of what she looks like, and also because black, pure white, and bright red seem too much for her, Winter is more or less ruled out. Speaking of color temperature, this woman seems to need some heat. People are generally not agreed on how much, but most agree she is neutral. Silver and gold both seem to work. Sometimes, gold might even seem to be better. Because Winter seems too much, and Summer is draining and not good at all, it is presumed she must be warm neutral. A woman next to whom rust and camel look like food or dirt. She may have come in liking and wearing these colors to begin with. She very quickly gets the "Honey, no." from girls on the group. She may or may not keep trying to convince them otherwise. Still, Autumn lipsticks look really muddy. A woman on whom, compared to the aforementioned rust and camel, coral and turquoise seem pretty effective. Her eyes brighten, her skin clears, she seems somewhat healthier. She may tell them this is a Bright Spring trial, or they might tell her that based on what seem in the picture to be those colors. Lipsticks may look better than Autumn as well. Some will continue to argue that they are too bright, but compared to the Autumn ones, they might still look better, because after all it is true she need some brightness. Because Autumn is the comparison presented, and because hue effects are some of the ones most poorly represented in photos, no one notices that her face has turned yellow the minute she put the lipstick on. Value reactions. They couldn't tell that Bright Spring was too light to define her. They forgot to check and see if she had edges to her features and to her face, or more likely they didn't know they were supposed to. Or, they could see that but they just assumed she was kind of a darker leaning one. Chroma reactions. The major points of argument for her being Bright Spring were basically her appearance, and the fact that everyone could see that the brightness of that season over Dark Autumn helped her considerably. Surely it would have been impossible to notice the greasiness of her skin in Bright Spring in a photo, if anyone had been checking. And again, because they have already decided that Bright Winter is too Bright (true), and True Winter is too cool (true), and she can't really be a Dark anyhow because she is too light looking (false), the group arrives at what seems to be the only logical conclusion. This probably was not lost on those trying to help online, but it's pretty hard to tell what looks good when colors in the photograph change with every shift of light, and on each persons different screen, etc, even as a trained analyst who knows what to look for. You really need to be in the room with the person, and in controlled lighting. The possibility they were never looking at Bright Spring colors to begin with. That is still true if she eventually went out and bought the fan. She doesn't know how to use it really, and even if she did it's easy to make this mistake sometimes. Ok, so the story continues. This woman eventually senses something is not right, and she shows up at my door for a PCA. She's pretty sure she's wasting her money and she's just going to be what everyone says, but she just wants to know for sure. When we reach the Dark Winter conclusion, her mind is blown. She's seen it all happen of course, she knows exactly how we got there and can see with her own eyes that it does work. Sooner or later though, whether right away or after a week of looking through Dark Winter pinterest boards, she becomes upset. "How can my colors be so heavy, dark, and sad?" she asks me. The simplest answer, one that happens to be true, is that they aren't. Of course everyone idea of what colors are depressing is different, but the main thing here is, when she asks this question, she inevitably thinks she has nothing but mulberry, aubergine, and blackened navy (not that there's anything wrong with those colors!). She's come to love the color she discovered in Bright Spring, and for good reason. Let me show you what I mean. Often, this woman has walked into her analysis telling me how well she suits coral and turquoise. Quite so, she does. Coral and turquoise can be some of the most surprising and flattering colors in the Dark Winter pallet. While, for this woman, the draping will reveal that these colors really have to be gotten right (meaning that they need to be precisely in her season and not any other sort of coral or turquoise) the effect can be excellent. Add to that list teal, a color which is extremely flattering on any of the 5 Autumn blends, and hot pink, a color that all 3 winters have some version of, and you start to see why it can be easy to mistake a light looking DW for BSp and why it is simply untrue that one is all happy and bright and the other dark depression. Please note that polyvores were created on my screen, using digital palette representations for harmony. Many of the actual items may be different seasons in reality, and the images of them may look very different on your screen. I hope that some of the general concepts will come through. It is certainly true that the overall look and feel of the Dark Winter colors here as a group is deeper richer and yes *a bit* duller compared with the light, bright airy, feeling of the Bright Spring group. Usually, regardless of her feeling about Bright Spring's light tangerines or palest aquas and yellow greens, she knows that those colors are not particularly flattering on her. Bright Spring on the other hand wears these colors very naturally as lightness and warmth at the same time her very much and her wheelhouse. What about the purse in the middle? Is it Bright Spring? Is it Dark Winter? Is it neither, perhaps? Does it really matter if this could be a logical part of either of these wardrobes? Especially of she loves it, probably not. Worth mentioning, it's totally okay to find another season more beautiful to look at than your own. What I see often is women who discount their own season without really knowing what it looks like, usually because of the name and/or what they see on Pinterest. Spend time with your pallete, see what you can make it do. How about purple and blue? Many, many Dark Winters, as well as Bright Springs both love and look good in their blues and purples. Many of them are not all that dissimilar, because of the inherent darkness of blue and purple. I've tried to expand these examples to include both the "Dark Winter would never" (the merlot dress in the corner) and "Bright Spring would never" (the light purple coat with the flowers) sides of the seasons. If someone didn't particularly care for either of those extreme, I think they could easily work with the tones that are neither. But ideally the colors they did choose would harmonize to those other colors, whether or not they actually chose to wear them. That's how we tested you, and how we know the difference between seasons when eyeballing it is hard to do. One more, though I could do several. Yellows and warmer greens. Though these colors are perhaps more readily associated with Bright Spring, Dark Winter is quite vibrant and exciting here, ranging to a very punchy icy acid green we use in analysis as a proof against Dark Autumn (who does not wear icy color well at all, or anything that close to white for that matter). Again notice how key it is that Dark Winter has a maximum darkness point which by far exceeds that of Bright Spring, and vice versa that Bright Spring can tolerate much more lightness, even near-pastels (which are kryptonite to the DW). Yet many, even most of the colors exist in a sort of overlapping midrange; the main apparent difference becomes heat level and a bit of saturation. Bright Spring would never wear the olive blouse. The amount of black in the two patterned dresses could get heavy on her. Dark Winter would never wear the light yellow purse, even as an accessory, or the dark yellow hat and scarf, especially next to the face. These are the extremes that are often not pushed in testing the seasons at home (some of these colors are not that easy to find!). I hope that this article has served to expand your notion of what Dark Winter can be, both colors and people, and also, perhaps most importantly, your understanding of PCA in general. P.S. If you've had a PCA from me, or one of my 12 Blueprints/Your Natural Design trained colleagues, reach out to me if you'd like to be added to our new private Facebook group. It's a great place to ask questions and share information. You sit down to go through your email today and find what appears to be a newsletter. You scroll down to find pictures of blouses in the colours and shapes that suit you better than any others could. In this email, each image would include some commentary to help you understand why the particular colours and shapes are so flattering for you. Next time you shop, your eyes would be able to seek out those designs, or similar ones that follow the same formula. In the open ocean of retail, you have a plan. You carry the thumbnail images in your head guiding what to choose, how to venture, and where to stop. While browsing, you recognize the items that you would have purchased a week ago, with a smile of relief for knowing your better choices today. Three months later, another email will arrive to show you how to buy dress styles that are most becoming to your body in colours that look beautiful next to yours. Three months later, it will be winter coats. You would begin to see what the items have in common, noticing the consistencies that run through each of your newsletters. As you begin transforming your wardrobe, you might notice that your overall image becomes much clearer with even small adjustments when colours and lines work together. Not only that, since the pictures are linked to the retail sites, you would gather a selection of stores and designers that could serve you best. More of your time, attention, and money would flow in directions that help you to truly look and feel better. We women want to navigate a shopping mall successfully to look creative at the office and still appear professional. We desire to express health and happiness in our appearance and still be taken seriously at a party. We wish for an appearance that speaks of elegance and style whatever our personal definition of those might be, authentic to our unique selves rather than looking like everyone else. Our clothes and jewelry can be extensions of that self, being true to our extrinsic colours, lines, and shapes, with the elements of intrinsic individuality that add excitement. Together, a woman and her apparel can bring out the absolute best in each other. All consumers need easy access to education and resources for shopping from a personal menu of Best Choices in the 21st Century shopping arena. Advice that is outdated, geared to flatter 20 year olds, either impossible to find or too common to suit more than a narrow percentage, is not helpful. If the woman leaves the image consulting service looking costumed for a part in on Broadway, unpredictable and eccentric, old-fashioned in some odd way that was never a style in any era, or too mystified by the system to direct her own shopping decisions, she has not been served as well as possible. The direction of fashion is presently in reverse. The process of fashion begins with clothing manufacturers and media that apply colours or styles to every woman indiscriminately to sell as much as possible before the trend dies out. We see the rise and fall of certain colours and styles, which, in reality, are truly flattering to a very narrow group of people, those that sell magazines. The wasted money is one problem. Our larger concern is the loss of self-esteem that accumulates over many years of feeling that we don't fit into a mold. Though every body is perfectly proportioned, we can feel doubt about ourselves. In time, a belief settles in that wherever we differ from models and a mannequin is a flaw. Nothing of the sort is remotely true. We are, each one of us, the mold that fashion should be retrofitted to. Signature/STYLE is a cooperative project between Rachel Nachmias and I. We will go shopping with your colours and image type in mind, assembling a collage of your most becoming selections from everyday retailers into a newsletter that will arrive every three months. Items from the fashion world will be featured, explained, and linked to direct you to colours and styles that you wear better than any other colouring or body type. To give you a sense of what to expect, for the past few months, we have pinned examples of the 12 Seasons' colours in combination with the 10 image archetypes (IA) to the Shopping for Your Season and Style board at Pinterest. The pins were chosen mostly from runways and lookbooks. The Signature/STYLE newsletter will contain real items available for purchase from the stores many of us visit often. There will be 20 different versions of Signature/STYLE, for the 20 possible Season and Archetype combinations. Each will focus on one of the 4 True Seasons, as Spring, Summer, Autumn, and Winter, and one of the 5 IAs, as Dramatic (D), Natural (N), Classic (C), Romantic (R), and Gamine (G), including its Yin and Yang variations (see Rachel’s' recent article here explaining IA. For every Season and Archetype pair, the Neutral Seasons and Ying/Yang variations of the IA will be presented in the same newsletter. This will allow you to compare your colours and lines with those of immediate neighbours to fine-tune your application of these concepts within your own palette and archetype. A Light Summer woman whose IA is YangRomantic (YangR) will subscribe to the Summer/Romantic newsletters. In every issue, she will find her best self in clothing, along with comparisons to how her True and Soft Summer sisters would dress, and a YinRomantic's adaptation of similar garments. A Dark Autumn YangNatural will subscribe to Autumn/Natural. A True Winter Dramatic will find her customized, personalized fashion review in the Winter/Dramatic issues. We agree that appearance improves substantially by simply knowing which of the 4 True Season groups and 5 Archetype options is yours. Even if you know Summer of some kind and Natural, you will learn so much, shop with renewed confidence, dramatically elevate your wardrobe, and skyrocket your appearance. The issue will begin with an image like the one above, to feature a relevant article from our sites, a beautiful cosmetic product, or any other information that would have value to your Season and Style. Following that will be the Product section, seen below, presenting nine garments with text describing the reasons for their inclusion. 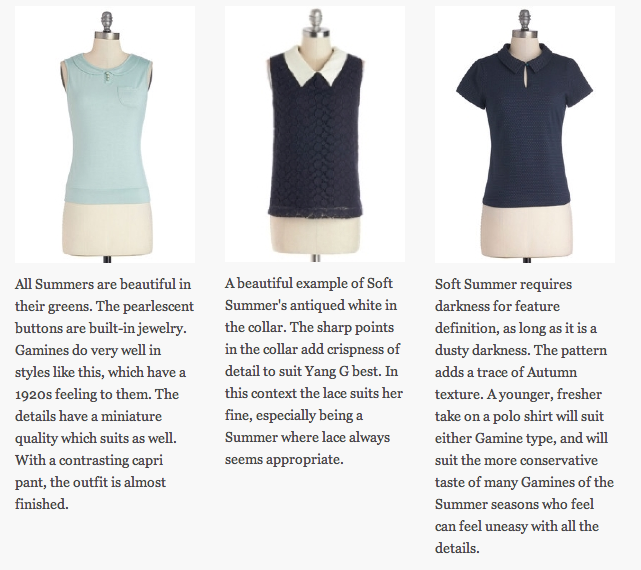 This example issue features sleeveless blouses for the True, Light, and Soft Summer woman of either YinGamine or YangGamine (YinG and YangG) archetypes, with explanations as to which woman wears the item best and why. Each issue will have a theme. The first issue looks at warm weather and lightweight dresses. Another one might be about pant legs. Who wears straight leg? Who wears bootcut? How wide is the bootcut for each body type that wears it? What's the best colour in jeans or your better-than-black for other occasions? Next time, it might be bathing suits. Which style flatters your body best and inherently understands where and how to define your waist? A True Winter YinR might express herself slightly differently in colour and style than a Dark Winter YinR. We'll show you how each woman wears her own design best. One day, you will find beautiful dress styles that seem to know intuitively how you want your clothing to fit. There really are items in every fashion category that have been adjusted to minimize or eliminate the problems you find over and over with mass-market or trending styles. The pictures from this example issue show the newsletter divided in sections. Of course, it will be merged into one piece when your email arrives. You can see the issue in its entirety here on the site itself. Issues will arrive quarterly. They will be responsive to all common computers, browsers, and mobile devices. Cost is US$35.99 for 12 months (4 issues). A one year commitment is required. Whenever you subscribe in a given year, you will receive all the issues from that year. Subscriptions begin 12 months from the sign-up date. The first issue includes Summer 2014 (now), Fall 2014, Winter 2014, and Spring 2015. Sign up is done in this way. When you visit Signature/STYLE, you will see a Subscribe link at the top left corner of the screen. Once the page opens, by clicking on the image of the newsletter, a box will open to select your Season and IA groups from two separate drop-down menus. Then click ADD TO CART. A box will open asking for the email address of the recipient. You can subscribe for as many versions as you wish at US$35.99 each. Once you have completed your selections, click on the cart icon at the upper right. A payment screen will open asking for your payment information and email address. It looks similar to the PayPal screens, but this payment is equally secure and powered by Stripe. You can complete the order and be returned to Signature/STYLE. You will receive an order confirmation email. The first issue will arrive within 48 hours of sign up, beginning with Sunday, August 17. If you subscribe between issues, you receive the previous three issues from that year within two days. The remaining issues of the subscription are sent as soon as they are released. If Christine were to categorize herself 10 years ago, she would have incorrectly chosen Autumn and Natural. In truth, she is Winter and Classic. We understand how difficult it is to know ourselves. Books and online education only take you so far. Sometimes, you need expert help. Your best bet is to begin with a correct and thorough personal colour analysis (PCA). You can find a directory of highly trained analysts working with the carefully calibrated 12 Blueprints drapes, here in the Directory on this site and at Your Natural Design here. This service cannot be performed accurately from photographs. Rachel can do personal Image Analysis (PIA) accurately online. You can find that information here. Due to the highly complex nature of analyzing someone's image archetype, I have decided not to publicly release a quiz for the foreseeable future. This is for everyone's benefit, because an incorrect type is of no use to you. If you wish to find out more about how I type, I encourage you to join my facebook group, Best Dressed Academy. Determining colour accurately online is impossible for faces and quite challenging for clothing. As everyone knows who has shopped online, the colours in the images may be different than the real garment. Please do remember that if you purchase, items are returnable. We have been surprised at how quickly stores are out of stock in various items. Should your item be no longer available when you receive your newsletter, take advantage of the learning opportunity. One day, that item will reappear and you won't miss it.